We have a special treat for all you Pokemon Go fans out there! A Pokeball rice cereal treat, that is! I’m on the hunt day and night because I want to be “the very best.” A Pokemon trainer can never attain “master level” by leaving home Pokeball-free. I remember growing up and collecting Pokemon cards, catching episodes every day after school, and drawing them during my free classes (I could never master the art of sketching Charmander, though). It was such a hit back then and I can’t believe how big of a hit it is today. An entirely new generation is enjoying a show that I was once addicted to. I love seeing kids like my nieces be in complete awe when they see Eevee evolve for the first time. I decided to make these Pokeball Cereal Treats because they are so fitting with the Pokemon Go trend. I figured that cereal treats would be the easiest to form into spheres but I didn’t realize how sticky they could get! A helpful hint: keep a bowl of water next to you while you’re forming them. By keeping your hands moist, you avoid any cereal mess and can actually shape your treats accordingly. While it took some trial and error (ex. : I thought my licorice sticks would wrap all the way around – they don’t), I absolutely love how these turned out. I may not be ten years old anymore, but I totally feel like I’m channeling my inner Pokemon Master with this fun dessert! Are you or your kids playing Pokemon Go? What do you love about the game? Share in the comments! 1. Start by preparing your cereal treats: in a medium-sized pot, add 2 cups of marshmallows and butter. Let met over medium heat on the stovetop. 2. Once marshmallow mixture is melted, mix into a large bowl with your cereal treats. Mix well. 4. In the meantime, cut your black licorice in small pieces, about 1/3 of an inch long. Cut your remaining mini marshmallows in half, width wise, so they become little discs. They will act as the center button that opens up your Pokeball. 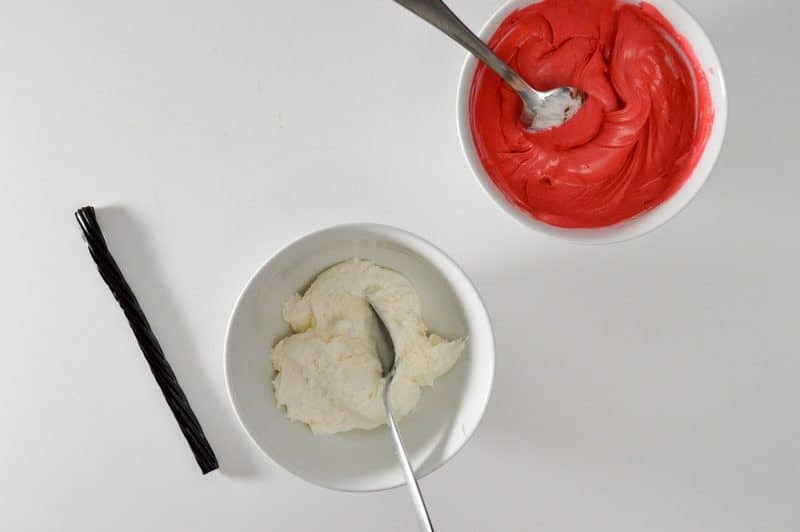 In two bowls, separate your buttercream icing and color one serving red. We prefer using gel food coloring because of its more saturated color. 5. Once the treats are chilled, coat half of the sphere with white icing. Place the licorice and the marshmallows discs in the center. Chill for 20 minutes. 6. Once chilled, ice the bottom half of the Pokeballs with your red icing. Let chill for another 20 minutes and serve/catch ’em all! Start by preparing your cereal treats: in a medium-sized pot, add 2 cups of marshmallows and butter. Let met over medium heat on the stovetop. Once marshmallow mixture is melted, mix into a large bowl with your cereal treats. Mix well. In the meantime, cut your black licorice in small pieces, about 1/3 of an inch long. Cut your remaining mini marshmallows in half, width wise, so they become little discs. They will act as the center button that opens up your Pokeball. In two bowls, separate your buttercream icing and color one serving red. We prefer using gel food coloring because of its more saturated color. Once the treats are chilled, coat half of the sphere with white icing. Place the licorice and the marshmallows discs in the center. Chill for 20 minutes. 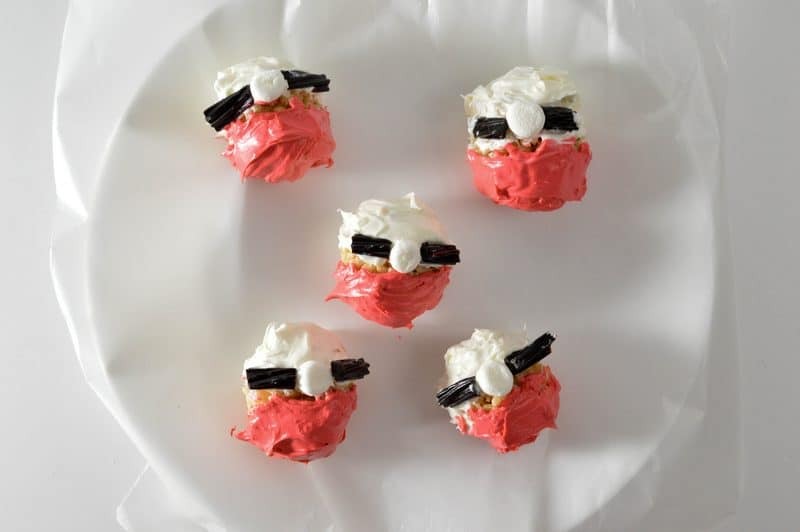 Once chilled, ice the bottom half of the Pokeballs with your red icing. Let chill for another 20 minutes and serve/catch 'em all! That’s it! You’re ready to head out with your tasty treat and start catching those Pokemon! Just remember to play safely. Not even the rarest Pokemon is worth getting hurt over. 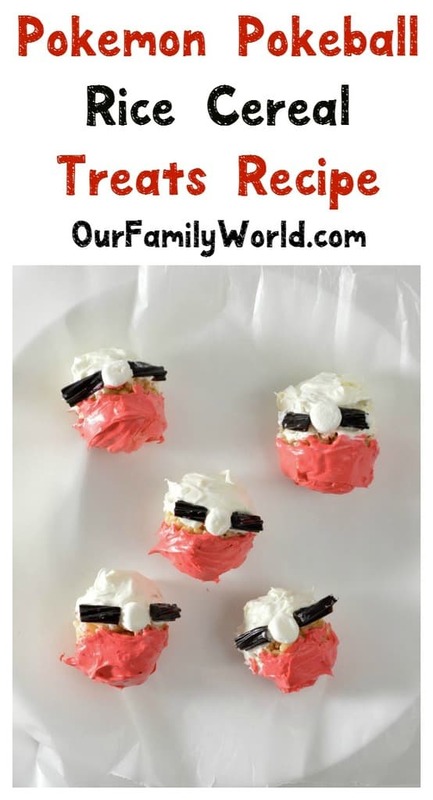 Looking for more fun treat recipes inspired by your kids’ favorite characters? Check out our Finding Dory Blueberry Ice-Cream or our Zootopia Paw-Sicles! Thanks so much for joining us at Delicious Dishes! We love your Pokemon Go Pokeball Cereal Treats and hope you’ll join us again this week! The perfect treat for Pokemon players! Thanks for sharing your recipe at the #HomeMattersParty – have a great weekend! My husband started playing this with our son, so I’m sure these treats would be a hit! Thanks for sharing at Merry Monday! So fast and simple to make. It’s great for getting kids involved, too! My granddaughter would love making these with me. Pokemon Go is such a hit I bet these delicious snacks will be a hit as well. I love these! So super easy. My kiddos will love these. These are so cute! I think they will be perfect for before our PokemonGo walk in the evening. My nieces are going to love them! Pokemon Go has become a crazy hit all over the world & a recipe related to it is going to be so much fun too. 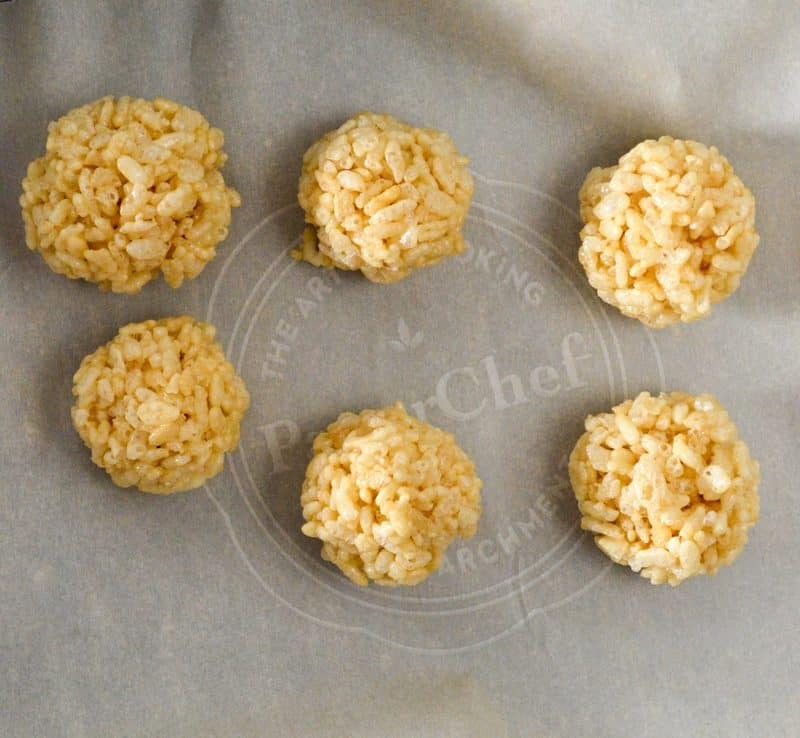 The Rice Cereal treat looks simple & easy to do and my kids are going to love it. Oh these are so cute! I did download the app but I haven’t played it a lot. It does seem fun though. Those are a great idea. Pokemon is so big right now! Everyone seems to be playing the Pokemon Go game. I love this simple recipe. Those are so adorable. They embody the Pokemon Go crazy perfectly. I love how easy these treats are to make! And I’m sure the kids would love to help out as well. It’s an awesome idea for snacks too since people are going crazy over the game! How cute!!! These could almost pass for Santas at Christmastime, too!